After the Monday designation of the Islamic Revolutionary Guards Corps by the US as a foreign terrorist organization, Iranian officials all rallied behind the IRGC, threatening the US with terrorism. Minutes after the designation, the Islamic Republic’s Supreme National Security Council (SNSC) designated the United States Central Command (CENTCOM) in the Middle-East and all its affiliates as a terrorist entity. Iran’s president, Hassan Rouhani cited the designation today in a speech to commemorate the “national anniversary of nuclear technology” and urged Iranians to resist “US pressures”. “If your intention with these sanctions was to reduce the military power of Iran, you should know that since last year we have had access to missiles and weapons that you could not even imagine,” he said indirectly threating the US with missile attacks. The Commander in Chief of the IRGC also threatened the US and called the designation “foolish”. Jafari threatened US forces stationed in western Asia and said that they “would no longer have their current peace”. The Iranian regime also sent and official message to the US via the Swiss Embassy in Tehran. According to Abbas Araghchi, the political deputy at the Ministry of Foreign Affairs of Iran the message said that Iran’s “reciprocal action would be straightforward and quick” adding that “the US would be directly responsible for any incident that followed”. “From now on, US troops in the region will not be ordinary troops for us. They are terrorist forces and US bases in the region are also terrorist bases, and the way we deal with them will certainly be different from the past,” the message said in a clear threat against American troops. 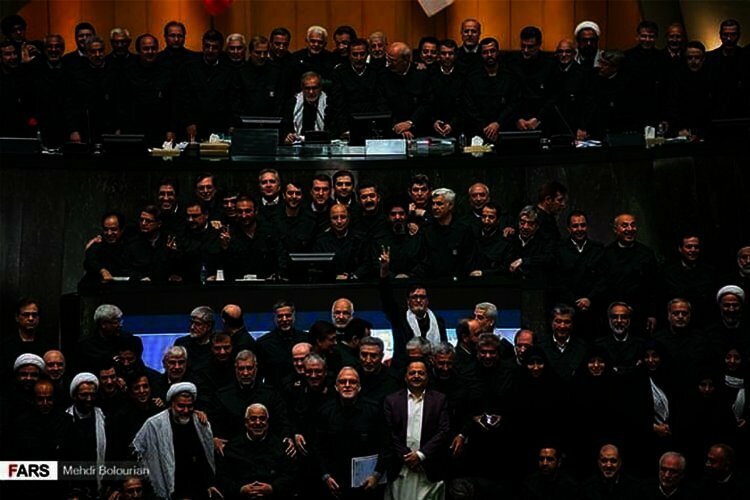 Also today, top members of Iran’s Majlis or parliament dressed in IRGC attire in support of the Guards. More than 200 Majlis members signed a double-urgency motion which designates the U.S. military and intelligence forces in western Asia as a terrorist entities. These threats prove once again that the IRGC’s fingerprints are evident on assassinations, bomb attacks, terrorism and the financing and military support of terrorist groups around the world and that the US designation was not only the right decision, but was long overdue.